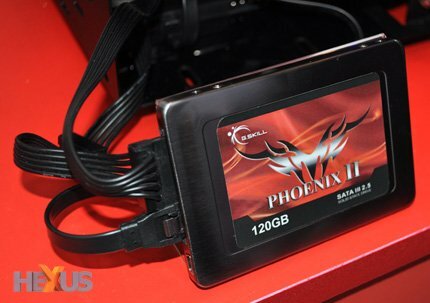 Hexus noticed G.Skill's Phoenix III solid state disk at CeBIT. This new model uses 25nm NAND flash memory and SandForce's new SATA 6Gbps SSD controller to deliver read speeds of up to 550MB/s and write speeds of up to 500MB/s. The 120GB model seems to cost around 299EUR, pricing of other models is still unknown. That's pretty much identical to most other upcoming SF-2000 drives, but how accurate are the manufacturer's specified numbers? We were able to see the Phoenix II ploughing through a session of ATTO on an AMD Phenom II X6 system, and make no mistake, this second-gen crop of SandForce-powered SSDs are quick.